Hunter Lab and XYZ are standard three dimensional color spaces that allows a precise definition of the color of a test sample. Color analysis can be used to match adjacent parts molded from different materials, or to evaluate color change due to outdoor exposure. Visual color and Spectrophotometer readings can also be affected by surface texture, molding parameters, processing method, and viewing light sources. 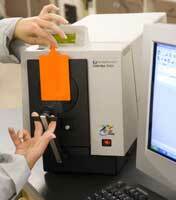 The BYK Gardner Spectrophotometer is highly automated. After specifying the illuminant, observer angle, and the reference color, the test sample is inserted into the specimen holder, and the spectrophotometer takes the reading. Typically a 50 mm (2") or 100 mm (4") disk, although any flat sample that the specimen holder will grasp can be tested.